Thermogenesis. Fancy word for a simple thing: the production of heat in living organisms. If you move more, you burn more. Muscle movements burn calories, and burning calories, like burning just about everything, gives off energy in the form of heat. Treadmill desking naturally requires more movement than sitting still – spend time walking and you may find yourself a little hot under the collar. Feeling the burn is a good thing, as any extra-intense physical trainer can tell you, but let’s save the sweat for the gym. Working while walking is all about comfort and productivity – so save the Rocky theme for later, hotshot, time to talk about staying cool. Trust us when we say that even though you’re only planning to walk at the recommended pace of 1 to 2 mph on your treadmill desk, you’re going to want a fan. Walk at your workstation long enough and eventually your body temperature will start to rise and perspiration will start to form – especially in an enclosed office, or a space with poor air circulation. The bigger you are the more energy it takes to move your body and the sooner you’ll begin to perspire. Depending on your size and physical conditioning perspiration could take an hour to set it, or only 10 minutes, but it will set in. The good news is at this rate of perspiration you only need a very light breeze – usually the lowest of fan settings – to get the air around you to move a little and keep you perfectly cool. Every treadmill desker should take some basic steps to beat the heat. Comfortable, light clothing is important – some workplaces may frown on athletic wear, but do what you can to keep ventilated. Not everyone can show up to work in short shorts, so for the rest of us, WorkWhileWalking would recommend investing in a wind tower. A fan, anyway; we’re just fond of tower systems. There’s nothing wrong with circular fans, but wind towers go so well with treadmill desks that we’d almost suspect that they were designed with them in mind (they weren’t; wind towers were chiefly designed to keep all the occupants of a bedroom equally cool on hot summer nights, by spreading the wind around evenly). First of all, they move more air; a multi-fan design makes wind towers one of the most effective, space-efficient cooling options. That same vertical arrangement helps keep a walker’s entire body comfortable. Desktop fans are common office accessories, but having your face blasted with cold air is less efficient – and less pleasant – than the even distribution of lighter winds offered by a tower. They’re also quieter, so you won’t get that unpleasant “working-in-a-wind-tunnel” rush of white noise every time the oscillating fan hits your headset microphone. Wind towers are often bought as bedside fans, and most were made with slumbering users in mind. So without any further ado, let’s look through some of our favorite tower fans. Pros: A relatively inexpensive, decent fan from an established manufacturer. The Wind Curve series has won praise from budget shoppers who found it to be both quiet and relatively powerful in comparison to other options in its price class. Top vents can tilt upward, a helpful option for treadmill desk users. Cons: Many users complained of flimsiness, and Wind Curves often developed problems after relatively short periods of use. In addition, several reviews mentioned a slight clicking noise from the base during oscillation. Obnoxiously bright LED display. Bottom Line: The Wind Curve series is far from perfect. Although often short-lived, the fans perform well for their price, and would be a fine addition to a budget walking workstation. Available in several different colors and shapes. Lasko offers several different Wind Curve tower fans. All are more or less equal; the two most popular models on Amazon, the #2554 and #2551, differ only in appearance. Wind Curves are variable 3-speed fans, with an automatic power-saving shutoff. These tower fans are far from the most powerful options out there, but most users will find them adequate. The main drawback to the Wind Curve comes from its all-plastic chassis. It’s the classic balance of reliability and cost. Are Wind Curves relatively cheap? Definitely, but you may find that buying one Wind Curve leads directly into buying another after the first one breaks. They do come with a one year warranty however, and Lasko has proven to be a generally responsive company. Pros: Respectable airflow to noise ratio. An easy-clean air filter and ionizer combo make the Honeywell a natural choice for any allergy sufferers in the market for a tower fan. Cons: Slightly more expensive and noisier than the cheaper Lasko fans. Some complaints of poor quality assurance, durability, and customer service. Bottom Line: A perfectly good, middle-of-the-road fan. The Honeywell’s improved air-purification system might appeal to some users. At this price range, WorkWhileWalking considers the tower fan market to be a two-dog race between this Honeywell offering and the Wind Curve series. Both fans bring their own advantages, and the Honeywell does lose in terms of noise, range of options, and cost. On the other hand, it’s slightly more durable than the Lasko, comes with a legitimately outstanding 5-year limited warranty, and can push a little more air. Sort of a judgement call, at this point. The ionizer/air filter combination of the Honeywell is also a nice addition, particularly given how easy they are to clean. Plenty of fans with ionizers make filter maintenance difficult; not so with the Honeywell, mercifully. The remote also comes with a flashlight – clearly a nod to the most common application of tower fans in darkened bedrooms – but you could also use it to signal flash Morse code to rest of the office. Pros: The Soleus Air’s base is unique among tower fans – and that’s a good thing for treadmill deskers. Unlike other fans, the Soleus sits back on a U-shaped foot, which tilts it up slightly, giving it a coverage perfectly suited to an elevated treadmill walker. The Air has also won consumer praise for power, and we’ve seen relatively few complaints of fragility. Cons: Some users have reported an unpleasant, persistent smell coming from the fan. Not as quiet as some other options, and not as pretty as some other options. Bottom Line: You’ll find quieter fans, and you’ll find cheaper ones, but the Air is extremely well-suited to treadmill workstations. This is one of the only options that can be placed in close proximity to a treadmill desk workstation and still provide full-body cooling. Soleus users have been almost unanimously pleased with their fans, and it doesn’t seem to have the QA issues that plague other towers. It seems like an incredibly minor design choice, but the horseshoe base of the Soleus really is what brings it head and shoulders above most of its competition. Some other fans, such as the Lasko, can tilt their upper vents, and the Ultra from Ozeri is adjustable-height, but neither of those features go as far toward keeping an elevated walker comfortable as the Soleus. This goes double in a cramped office – placing a fan farther away from you will help cool your entire body, but airflow dissipates over distance, and some of us just don’t have the distance to work with. Yes, you could invade a neighbor’s desk space, but you’d better be prepared for reprisals – much better to just grab a Soleus. Tilt aside, you’re looking at a very well-built fan on the pricier end of the scale. The Air is largely reliable, and while the one-year limited warranty is less than outstanding, we’ve seen very few complaints of early breakage. Pros: The Ozeri can shift some serious air, and does so relatively quietly. An adjustable-height base allows you to find a comfortable level for your airflow, choose your height carefully though, the Ozeri isn’t exactly easy to shift on the fly. 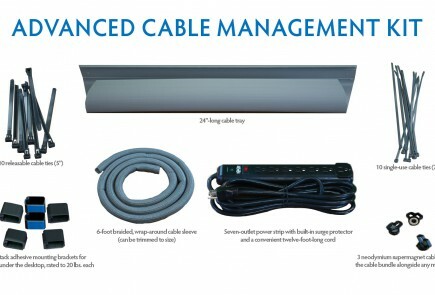 Attractive display and remote control. Cons: You’d really think a fan system this good would come with a better base – it doesn’t. The Ozeri fan base is entirely plastic, and feels very flimsy. In fact, customers had problems with the rest of the casing as well; the Ozeri wobbles while oscillating, and the combination of cheap material and poor packing has led to reports of delivery-damaged fans. Bottom Line: An excellent fan mechanism with a subpar chassis that also can’t be tilted back to effectively hit your upper body. The Ozeri is both powerful and quiet, even at higher settings. However, consistent quality control issues dog what would otherwise be an absolutely superb mid-price product. Looking for a relaxing interlude? Visit the Ozeri site. The calming music, sea-tones, and papyrus fonts should…aw heck, we’re kidding – it’s really annoying. There’s a mute button on the top right. Actually, we don’t recommend visiting it at all, Ozeri offers little to no useful information on its own site. That said, it’s not for want of information to offer. 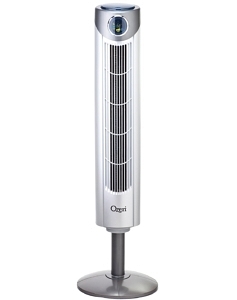 Ozeri has a long, respected track record as a manufacturer of luxury tech goods, and this $100 tower fan is a fine addition. The Ultra isn’t perfect, but it’s also one of the more powerful fans you’ll find in its price category. It has all the amenities normally found on nicer tower fans. An LED display, remote, 3 variable speeds, and a 12-hour timer all come standard on the Ultra – we particularly liked the easy-to-understand readout. The Ultra does come with a more-or-less standard one-year warranty. There are also a couple of distinguishing features worth mentioning. The Ultra comes with a temperature readout, a helpful feature for quantitatively-oriented deskers. We’re not entirely sure what Ozeri’s noise reduction technology is, but it works really, really well. For all the problems the Ultra comes with, you’re not going to find many other moderately priced options this powerful and quiet. Pros: Dyson’s “Air Multiplier” technology is entirely unlike anything we’ve seen on other fans. Instead of blades, the AMs act like tiny jet engines, drawing air in through the base, and blasting it out through a cooling tunnel in a continuous stream. As a result, you’re looking at a completely bladeless system – more powerful, safer, smoother, and easier to clean than anything else on the market. Plus, let’s be honest: they look so, so awesome. Cons: Incredibly expensive, also surprisingly noisy. The vast quantities of air these things can move do produce a very audible rush. Bottom Line: If you’re after a truly unique solution to workstation cooling, then you couldn’t do much better than one of these Dysons. On the other hand, you may need to sell your car to afford one. So far we’ve reviewed your “good” and “better” options for tower fans, two of our favorite options at lower price ranges. But what if you’re after something more exotic? Tower fans are nice, but hey, sometimes you just want something that looks like it came off the set for Star Trek. Enter Dyson, and this crazy, bladeless series of fans. If you’re in need of some intense airflow, and have the cash to spot it, then you may have found your fan. 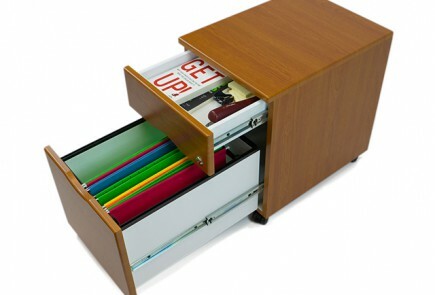 The AM family can cool a room, and a desker, in a hurry. The Dyson does sacrifice the LED displays of other fans for the sake of a sleeker look. However, the dimmer switch it uses in place of variable speeds is a great addition. As is the magnetic, slip on remote. The 2-year warranty common to the AM family is among the best we’ve seen for tower fans – as it should be, given the cost. But, which AM to pick? We would recommend avoiding the tabletop options, as they won’t do your lower body much good. Instead, consider one of the larger options, such as the AM02 or AM03. For treadmill desking, we’re inclined toward the AM03. It has a smaller wind tunnel, but can be tilted, and comes with the Dyson personal cooling option. What else can you do besides using a fan to stay cool? There are tactics for getting by without a fan. The most obvious, perhaps, is to just slow down the treadmill a bit. The best tactic for those seeking to lose weight is to keep the room cooler – if you have isolated thermostat control and work alone – to burn more . Failing that, you can always hire a friend with a palm frond, though that’s not a fix we’d recommend for work.